Well, this couldn't be more timely in regards to my last post concerning the rise of illicit economies and the subsequent subterranean urbanism of the future. 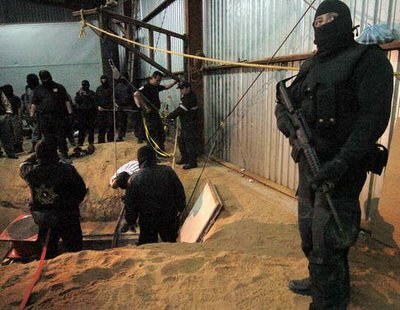 Mexican investigators discovered an entrance to a tunnel inside a warehouse in San Diego just outside the airport in Tijuana, Mexico. 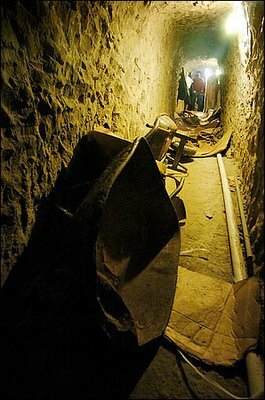 But, when they examined it further, officials realized they had uncovered what turned out to be "one of the longest and most sophisticated cross-border tunnels ever discovered." From the AP: "The size and scale of the tunnel — the 21st discovered in more than four years - was at least 60 feet below U.S. soil and 2,400 feet long. (Some reports are estimating 3,789 feet long and 89 feet deep). Authorities found a tunnel floor lined with cement, lights that ran down one of the hard soil walls, and air piped down from the surface. An adult could stand in the 5-foot-high shaft, and a 6-by-10-foot cement shaft equipped with a pulley dropped about 75 feet to the tunnel." 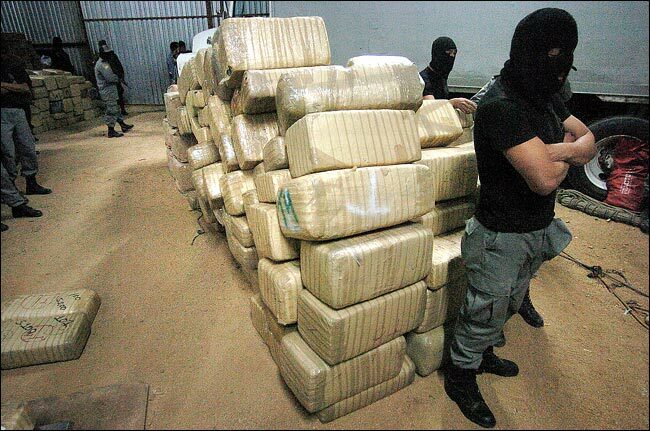 At least 2 tons of pot were found stacked like bagged treasure in the tunnel on the Mexican side, and another 200 pounds lay undisturbed on the American side. Investigators had no clue whether the tunnel had been used for anything other than smuggling drugs. 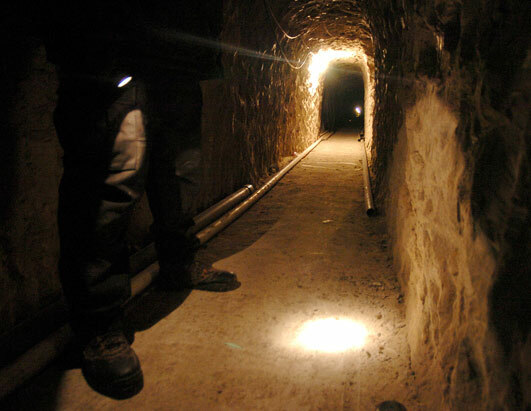 This makes the fourth tunnel discovered this month along the Tijuana-San Diego border, and, yet, you get the sense that investigators have merely only scratched the surface of what's beginning to look like an epic subterranean labyrinth of dank corridors, trapped whispers, and lots of lonely long turns. Oh, what I wouldn't give for a tour. January 24th/25th, 2006 – A 2,600-foot-long tunnel between an industrial building near Tijuana's airport and a warehouse near Siempre Viva Road in Otay Mesa. Feb. 25, 2005 – A 600-foot tunnel between a house in Mexicali and a house in Calexico. Feb. 27, 2002 – A 1,200-foot tunnel between a ranch house on the outskirts of Tecate, Mexico, and an unoccupied house in Tierra del Sol near Boulevard. May 31, 1993 – An unfinished 1,450-foot tunnel that began in an industrial building near Tijuana's airport. The tunnelers were headed toward a warehouse on Siempre Viva Road in Otay Mesa, but were about 120 feet short when it was discovered. Watch the video on CNN, and from the AP found here. (scroll down).